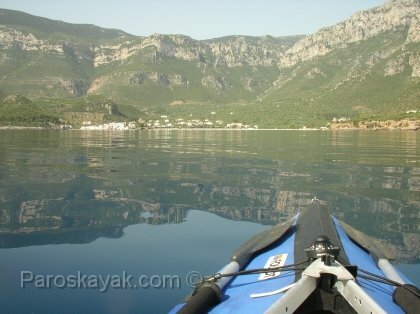 Sea kayaking offers a unique perspective of the Greek islands and their coastline. It is an excellent way to tour the Greek isles while appreciating the natural environment and the wildlife. Environmental stewardship and Leave No Trace principles are very important and you should practice them in the fragile marine ecosystems of Greece. Take Only Pictures, Leave Only Footprints. We would love to meet with people who share the passion of sea kayaking. We do not offer commercial, guided tours or any rental services at this time. However, you can always arrange trips or rentals with a few outfitters in Greece. Sea kayaking is a relatively new sport in Greece so there are not many guided trips to chose from. A number of outfitters operate in Greece, but as I have not paddled with any of these folks, I cannot recommend a particular one. Contact us via email for any information/tips regarding the weather in Greece, expedition planning, resupply logistics or even selecting routes, island crossings, and places to explore.